Will Kendall survive his clan’s massacre and live out his destiny as the last Snake Runner? Kendall can’t believe how quickly his dad remarried after his mom died, and he especially can’t believe his dad’s choice: Juanita is of Spanish descent. That feels like a slap in the face considering Kendall’s mom was Native American. This is all more than Kendall can handle, and he needs to get away to the desert where he can think. And especially where he can run. Running is his destiny: he’s the last member of the Snake Clan, the clan known for its long runs across the desert floor-until the Spanish arrived in the Southwest and destroyed the tribe. When Kendall slips through a hole in time, he finds himself 400 years in the past, just as the Spanish, with their guns and armor, are starting to lay claim to the Southwest. Can Kendall survive the horrible battles so he can return to his own time? Will he become the last Snake Runner, as the spirits have told him he must? More importantly, what will he learn about himself in the process? Fourteen-year-old Kendall, half Anglo and half Acoma Indian, travels through time to sixteenth-century Acoma, New Mexico, where, in the midst of the invasion of Spanish conquistadors, he joins his Acoma ancestors to play his destined role as the last member of the Snake Clan. 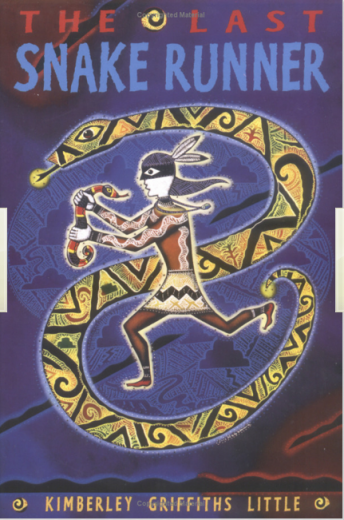 Grade 6-10: A sequel to Enchanted Runner (Avon, 1999), this book stands on its own as a work of historical fiction and a time-travel story. Kendall, 14, has rediscovered his Native American roots in New Mexico at the Acoma Pueblo, ancestral home of his mother's family. He is the last of the Snake Clan, a long line of warriors and mystics responsible for carrying out the yearly ceremonies that propitiate the gods and bring rain. In his modern existence, he is struggling to deal with the death of his mother. When his father remarries, the teen cannot accept the woman, and he flees into the desert. Transported back to 1598, he becomes part of the vibrant life of the Acoma people, who live on a mesa and farm the surrounding land. The tribe's interaction with a group of Spaniards outfitted in armor results in tragic and devastating consequences, with Kendall a participant, witness, and one of the few survivors. The violence and brutality are powerfully portrayed in this action-filled story. Details of everyday life on the mesa and the people's strong spiritual connection to the land are what make this book stand apart from many other time-travel stories. An author's note explains that the historical events described are based on an eyewitness account by one of the Spanish soldiers. The novel succeeds as a fast-paced adventure and as a meditation on the consequences of a clash of dissimilar cultures. ah lunchboxes… oclicaonasly i’ll still take to work, but its not as fancy as yours! Salmon dried fish floss, interesting, wonder if u can find it here in Sydney. Cockayne has spent his entire first year being realtively obnoxious on almost every subject. I wonder what the voters reaction will be to that next year. Easy! You will see all Republicans in office next year!